The Yellow-throated Vireo is the most colorful of the vireos with a bright yellow wash over the head and breast and prominent yellow "spectacles." It is sometimes overlooked because it moves slowly high in the canopy and is a less persistent singer than some of the other vireos. The breeding range extends across eastern North America and it spends the winter from southern Mexico to northern South America, and in the Caribbean. Description: This large headed songbird has a bright yellow throat and breast, and a broad yellow eye-ring extending to its thick, black bill. It has a white belly, an olive-green back, and two white wing-bars in its gray wings. The male and female look the same. Pine Warblers are similarly patterned, but have dusky streaking on the yellow chest, white spots under the tail, and a thinner bill. Yellow-breasted Chats lack wing-bars, and have white spectacles, not yellow, and are found in shrubby habitats rather than mature forest canopy. 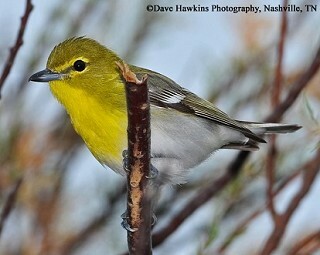 Habitat: In Tennessee, the Yellow-throated Vireo breeds in large tracks of mature open deciduous woodlands and mixed deciduous forests, below 3,000 feet elevation. Diet: Insects, some fruits and seeds. Nesting and reproduction: An unmated male will sometimes begin to build a nest, and when the female arrives, he will display to her at the unfinished nest. Clutch Size: Usually 4 eggs, with a range of 3 to 5. Incubation: Both adults incubate the eggs for about 2 weeks. Fledging: Both the male and female feed the young, which fledge in about 14 days. The fledglings remain dependent on the adults for food for another 2 weeks. Nest: The male sometimes starts, and the female finishes, the open cup-nest, which is usually suspended by the rim from the fork of a small branch high in the canopy. The nest is made of bark strips, dry grasses, and plant fibers, and lined with fine grasses and hair. It is held together with spider webs, and the outside is decorated with lichens, and moss. Status in Tennessee: The Yellow-throated Vireo is a fairly common to uncommon migrant and summer resident across the state. It usually arrives by early April and departs by mid-September. Based on Breeding Bird Survey trends, the species appears to be increasing in the state. The Yellow-throated Vireo requires large blocks of forest for successful breeding. Breeding density was found to decrease sharply in forests smaller than 250 acres in the northeastern United States. In winter, the Yellow-throated Vireo usually occurs singly within mixed-species foraging flocks. It inhabits a variety of tropical forests from dry forest to lowland rainforest, and up to 6,000 feet elevation. Brown-headed Cowbirds often parasitize Yellow-throated Vireo nests. The vireos will sometimes build a new floor over the eggs and lay a new clutch on top. Louis Jean Pierre Vieillot, a French ornithologist, first described the Yellow-throated Vireo in 1808. Best places to see in Tennessee: Yellow-throated Vireos can be found starting in early April in large mature deciduous and mixed deciduous forests across the state. They are easier to find early in the season when they are singing more frequently. Rodewald, Paul G. and Ross D. James. 1996. Yellow-throated Vireo (Vireo flavifrons ), The Birds of North America, No. 247 (A. Poole and F. Gill, eds.). The Academy of Natural Sciences, Philadelphia, PA, and The American Ornithologists' Union, Washington, D.C.